By now, you know that Forza Horizon 2 is coming to Xbox One and Xbox 360 on September 30. You know that this is the next great edition in the Forza franchise, and a follow-up to the original Forza Horizon which was released in 2012. Yes, this one’s being developed by our friends at Playground Games and it’s bigger, better, and more epic than ever before. If you’ve read our previous coverage of our game, none of this is news. What you might not know is what it’s like to PLAY Forza Horizon 2. 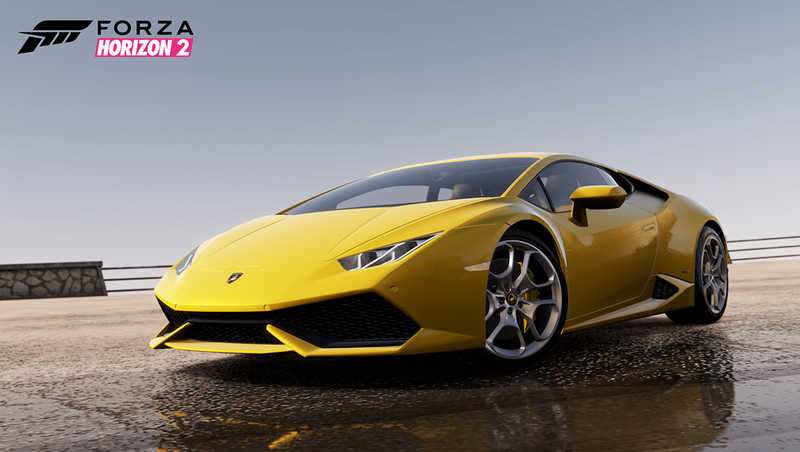 At E3 2014, we have a playable demo of Horizon 2 on the show floor in the Xbox booth, sitting comfortably next to the Lamborghini Huracán display car (which, not coincidentally, happens to be our cover car for Horizon 2). While thousands of people will get a chance to try Forza Horizon 2 in Los Angeles this week, I wanted to give those of you who couldn’t play the demo for yourselves a hands-on report of this brief but jam-packed demo, and how it relates to the larger game we’ll all be playing on September 30. First off, the setting: In Forza Horizon 2, you’ll be exploring a massive, wide-open world. This time around, you’ll be driving through the scenic highways and byways of southern Europe – if you think of the south of France and the Amalfi Coast in Italy, you’ve got a great idea of the area we’re talking about. It’s one of the most beautiful regions of the world and, as you’ll discover, it is fertile ground for some amazing driving adventures. Our E3 “Road Trip” demo kicks off at the Horizon Festival – where high-performance supercars abound and music and the sounds of partying Festival-goers surround you. You’ll be able to get behind the wheel of one of three of these amazing rides: the 2014 Lamborghini Huracán LP610-4, the 2012 Nissan GT-R Black Edition, and the 2014 Chevrolet Corvette Stingray. Each of these high-performance cars is built with the same obsessive detail that Forza fans have come to expect -- built for speed and the action-packed driving that defines the Forza Horizon 2 experience. Once you’ve got your car of choice, it’s off to the races. The E3 demo is a sprint to the finish through the back roads of Tuscany in northern Italy, and the setting gives you a real flavor for the kind of epic variety that you’ll find throughout Forza Horizon 2. One of the things you notice right away: the roads are only a suggestion. 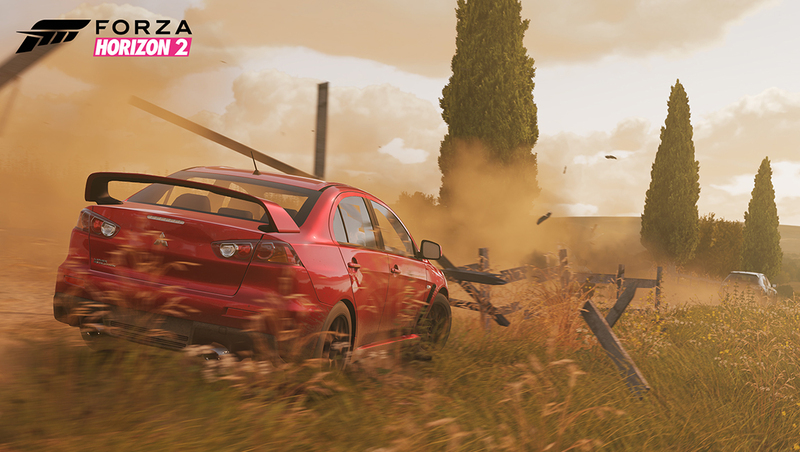 Forza Horizon 2 features a wide-open world, where you can go wherever you like, so your path to victory is up to you. In the E3 demo this is immediately apparent, as you can leave the road and start driving through fields of grass and hilly vineyards pretty much right away, blasting through bales of hay and fences as you race alongside eleven other Drivatar-powered opponents. These Drivatars are all based on Playground developers and, as you can see from just a single play-through, each has its own ideas of how to get through the demo course. Some play by the rules and stick to the roads; others get off-road as soon as possible, taking every possible shortcut and collecting dirt and grime on their cars as a result. Watching the Drivatar opponents adapt to the open-world choices available to them in Horizon 2 is awesome to see and definitely provides a challenge for the race. The driving experience of Forza Horizon 2 is all about pure action. Jumps are everywhere, drifting is heartily encouraged, and crashing through barriers to get where you’re going is practically a necessity. At its heart, Horizon 2 is about taking risks and earning rewards for showing of your skill and style. As you drive, you’ll be earning skill points, and the more audacious the moves you pull off behind the wheel – for everything from catching air to pulling off extended drifts – the bigger the points bonuses you’ll earn. Before you know it, you’re travelling at something approaching top speed, winding your way along a scenic cliff-side highway along the gleaming Mediterranean coast. If you’re good, and a bit lucky, you’re in first place and you’re looking forward to a nice leisurely cruise to the finish line. And then the rain begins to fall. 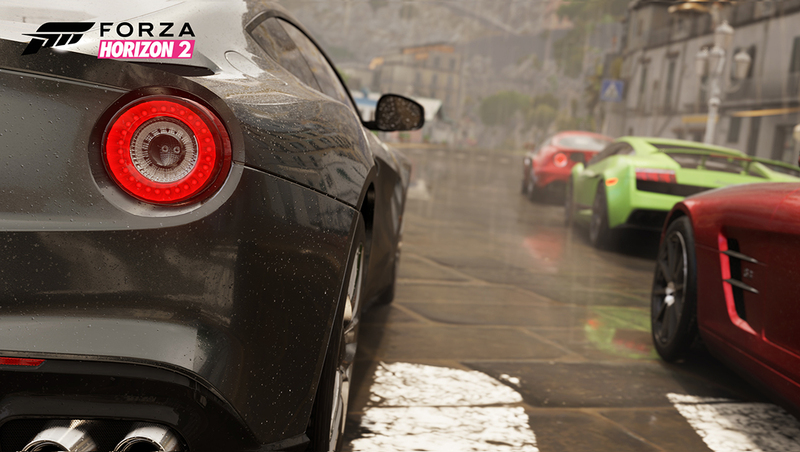 For the first time in any Forza game, weather will play a factor in how you drive. The rain in Forza Horizon 2 isn’t just spectacular to look at, it will have a definite effect on how your car handles as it slides across the wet roads. For a longtime Forza fan like me, the experience of driving in cockpit view with the rain spattering down on the windshield (wiped away by the functional windshield wipers for every single car in the game) is something akin to a religious experience – one we’ve waited on for a long, long time. The final section of the demo race introduces another fun twist. As you close in on the final mile of the race, you’re given a choice to stay on the elevated cliff side road, or take a brief downhill blast along a dirt road shortcut. Whether this shortcut will actually result in a faster time will likely depend on which of your opponents decides to take the shortcut with you. The E3 demo race ends in a lovely seaside town and, as you cross the finish line, you’re greeted by the cheers of the Horizon Festival attendees who came to see you and your fellow racers do what you do best. In all, the demo is an adrenaline rush, one that packs a lot of fun and a lot of information about the game in just a few action-packed minutes of racing. Best of all, the E3 demo is just a small taste of what the larger world of Forza Horizon 2 will offer. As fun as it is, however, there’s still so much more to tell you about Forza Horizon 2. Features like the dynamic day/night cycle; Car Clubs that allow as many as 1000 members, allowing your Club to become a community of its own; instant online play with no lobbies and no waiting; an amazing list of more than 200 playable cars; and miles and miles of the most beautiful roads you’ve ever driven. Check out our full announcement story for more details on the game and stay tuned for more information throughout the summer. Forza Horizon 2 is the ultimate car fantasy. Get ready to leave your limits; Forza Horizon 2 will be released on Xbox One and Xbox 360 on September 30.